Cattle supply important amounts of nutritious products such as beef and milk for human consumption. However, cattle excrete large amounts of feces and urine with low utilization rate of dietary crude protein (CP). These not only negatively affect the global environment by emissions of ammonia (NH3) and nitrous oxide (N2O) and bleaching the soil and underground water, but also increase the feed cost. The low nitrogen (N) utilization rate of cattle could possibly result from the activity of rumen microorganisms degrading feed CP. 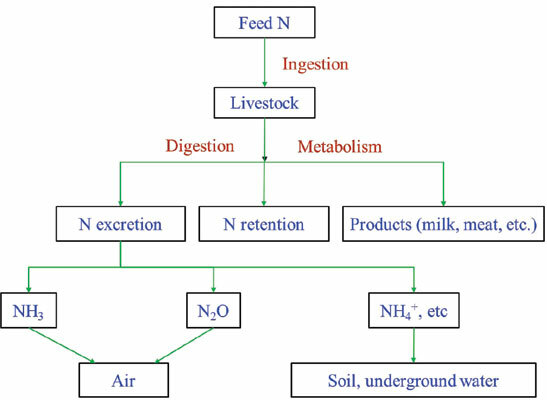 Many studies indicate that it is possible to manipulate the N metabolism to improve the N utilization rate of cattle through nutritional approaches, such as dietary supplementation of rumen protected essential amino acids (EAA) including methionine (Met), lysine (Lys) and EAA analogs or feeding rations with relatively low N concentration. It is necessary to study the microbial synthesis of EAA in the rumen, the requirements of EAA of cattle under different feeding regimes, and to develop products which are more efficient and less costly to improve the N utilization rate of cattle. Feed, protein, cattle, utilization, nutritional approaches, human consumption.